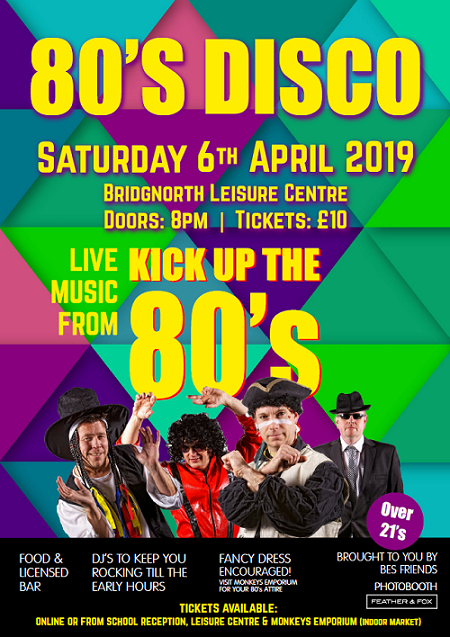 Tickets are now on sale for a spectacular 80s disco event, being held at Bridgnorth Endowed Leisure Centre on Saturday 6th April for over 21s. There’ll be live music from tribute party band, Kick Up the 80s, as well as a DJ line-up to keep you dancing until the early hours. Enjoy street food and a licensed bar plus a mirror photo booth, complete with funky backdrops and props, to capture the evening’s fun and festivities. Fancy dress is encouraged and Mr Monkey’s Emporium, based in the Indoor Market, are happy to help you find costumes to dazzle. Organised by Bridgnorth Endowed School’s PTA, BES Friends, and creative events company, Feather & Fox, this exciting fundraiser is set to be a night to remember. Priced at £10 each, tickets are available to buy online via the PayPal link below or from the Leisure Centre, School Reception and Mr Monkey’s Emporium in the Indoor Market. The money raised will go to the PTA, which plays an important role in providing essential equipment to enhance the learning experience at the school.